Mark's birthday is this Thursday! I realized I'd never made the man of my life anything but a card! So, with determination I set out to create a manly object, project....whatever, just something that Mark could see and touch.....that I made especially for him! 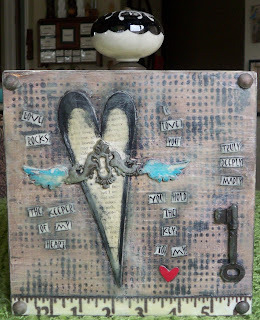 I wanted to share the completed "Box of Love" that was so much fun to make. Here you can see the sides and bottom of the box. Love is patient, Love is kind, It is not jealous, Love is not pompous, It is not inflated, It is not rude, It does not seek its own interest, It is not quick-tempered, It does not brood over injury, It does not rejoice over wrongdoing but rejoices with the truth. It bears all things, believes all things, hopes all things, endures all things, Love - never - fails. Hmmmm.....that touches my heart and warms me all over. I hope this reading gives you a breath of fresh air and you have a beautiful day full of blessings. Since I have just gotten my computer back up and running I am just now seeing this. I LOVE LOVE LOVE the "box of love". I am sure he loved it and I just love the photo touches. What a great gift! I will be blogging lots in the next couple of days. lots of catching up to do. Love you!